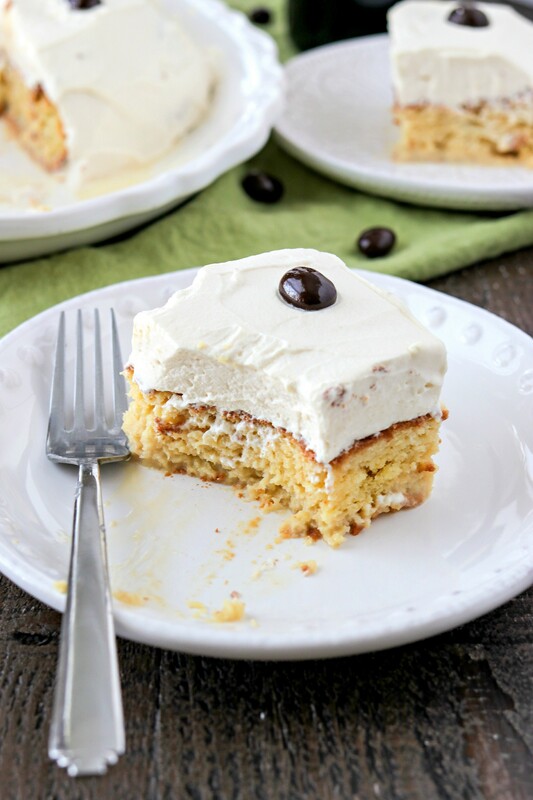 Irish Cream Tres Leches – A traditional tres leches cakes soaked with three milks (cream, condensed milk, evaporated milk) but now with an added kick from Bailey’s Irish Cream liqueur. This cake is perfect for your St. Patrick’s Day celebrations! Let the countdown to St. Patrick’s Day begin! Do you have plans for it this year? What kinds of ways do you celebrate? We never really celebrate it. It’s just too crazy for me to go out and pay crazy amounts of money to be surrounded by obnoxious drunks. I rather just stay in and make Irish coffees and eat Irish foods. Is this what growing up feels like??? This year, however, we have slightly different plans: we booked a trip to Boston! We planned to go to Boston last fall but couldn’t make it work. So we decided to go this spring. The only time we could make it work was this weekend and we just so happen to arrive on St. Patrick’s Day. Boston in a known for being rich in Irish Catholic culture so there are TONS of Irish pubs around us so we’ll have plenty to do on Friday evening. I even bought us Irish head-gear (a hat for my husband and a headband for me) and necklaces to show our pride. Who’s obnoxious now?! Since I won’t be able to enjoy my own homemade Irish fare on St. Patrick’s Day, I made some ahead of time. I couldn’t decide on what I wanted to make so I took a look at my baking bucket list. Yup, that’s a thing. I’ve been keeping a running list of things I need to bake for years. Other things on the list: every kind of bread, the perfect shortbread cookies, and cannolis. While looking through the list, I saw exactly what I was gonna make: tres leches cake! I am OBSESSED with tres leches- how could you not be?! It’s a fluffy cake soaked in three (tres) milks (leches) – heavy cream, evaporated milk, and sweetened condensed milk. But I’ve never made it at home before. Why not use this opportunity to make my first tres leches cake, but with an Irish flair?! And so the Irish cream tres leches cake was born! When I first took a bite of the finished product, I seriously melted from pure delight. Holy moly! The flavor was on point, the texture was perfectly moist, and the Irish cream stood out without being overwhelming. It was utter perfection. I was honestly shocked that my first tres leches came out this great! Tres leches can be tricky because you want the cake to soak up all the milk but don’t want it to get soggy and grainy. I’ve had some at restaurants that were soaked in milk but still tasted dry. Sometimes soaking a dry, bland cake in milk just isn’t enough to save it. In my research of the perfect tres leches cake, I learned that you want to make a light and airy cake that has air pockets all throughout which can soak up as much milk as possible. But! You also need to have a cake that’s strong enough to hold all the milk without falling apart and getting mushy. This cake accomplishes both, mostly thanks to the whipped egg whites that you gently mix into the cake batter. See how fluffy the batter is?! After you make the cake and it cools completely, you turn the cake over onto a serving platter. Then, poke even more holes into the cake to help it absorb as much milk as possible. Now it’s time to pour the milk all over and let it soak into the cake. It will probably pool on top and n the sides, but don’t worry it will soon get absorbed by the cake. To top the cake, the traditional topping is whipped cream and a maraschino cherry. But since this is an Irish cream tres leches, we’re topping with Irish whipped cream, made with heavy cream, sugar, and, of course, Irish cream. And instead of a maraschino cherry, I decided to top with a chocolate-covered espresso bean. There’s just something about Irish cream that reminds me of coffee so I liked this garnish better than a cherry. As I said above, the key to an amazing tres leches in a light and airy cake that can absorb all of the milk. We achieve this by mixing in the whipped egg whites separately. Make sure you gently stir the egg whites into the cake batter so they don’t deflate. Make sure you make the cake until its deep golden brown. I know this goes against your instinct to bake the cake until it’s just a light golden brown on the edges. But trust me – if the cake is too fluffy, it will get soggy when soaked in the milk. Check out the picture above to see how dark the cake should be once it’s done. The cake tastes best when it’s had enough time to absorb the milk, about 1 hour. But I will say…the cake tasted even better the next day. So if you can wait, let it sit overnight before serving. Since we’re flipping the cake onto a serving platter, it is so important that you probably grease the pan so that the cake won’t stick. I always butter my dish and then sprinkle with a little flour. This has not failed me yet! If you don’t have a serving dish that can fit the cake, you can leave the cake in the cake pan. But just be careful when adding the milk mixture – it may overflow a little if you add it too quickly before it’s had time to get absorbed by the cake. Well, that’s all there is to it! Hurry and get the ingredients today so you can make it for St. Patrick’s Day this Friday! What else do you have on you menu for Friday?? Let me know in the comments below! A traditional tres leches cakes soaked with three milks (cream, condensed milk, evaporated milk) but now with an added kick from Bailey's Irish Cream liqueur. This cake is perfect for your St. Patrick's Day celebrations! Pour batter into prepared cake pan and smooth out with a spatula. Place in preheated oven to bake for 35 minutes, or until golden brown on top. It may be done sooner than 35 minutes but it's important that the cake is golden brown on top so that it soaks up the leches. Mix Irish cream, heavy cream, condensed milk, and evaporated milk together in a large bowl. Slowly pour the mixture all over the cake and make sure to get the edges too. There will be some pooling on top and on the sides but don't worry, that will all get soaked up. When the cake has set for at least 30 minutes, it's time to top with Irish whipped cream. Place 2 cups of heavy cream, 3 tablespoons of sugar, and 1/2 cup of Irish cream in the bowl of stand mixer. Beat on high until stiff peaks form. Dump out whipped cream all over the cake and begin spreading it evenly with an offset spatula. I didn't spread along the edges, but you can if you want to. Place 18 chocolate covered espresso beans on top of the cake, evenly spaced. I spaced them so that the bean would sit in the middle of each slice. Can this be made with two 9″ rounds? Yes! I haven’t tried using two rounds but I don’t foresee any issues. However, make sure to check the cooking time because it will probably take less time for the cake to bake when split into two rounds rather than making a large rectangle. Let me know how it turns out!! This is completely gorgeous, and those chocolate espresso beans are quite the finishing touch! I love a really good Tres Leches cake and yours looks perfect. The cake looks so light and airy and the addition of Bailey’s is brilliant. So festive! I have never heard of an Irish tres leches, but I’m loving it! I bet it taste delish. This looks so delicious and moist! Your photographs are so beautiful..
Aw you are so sweet! Thanks so much! This looks crazy good! Looks like you really know your cake textures, can’t wait to try! YUM! This dessert looks amazing. A delicious twist on one of my all-time favorites! Oh my gosh my mouth is watering!!! this looks so good. Yum! I looooove Bailey’s. Can’t wait to try out this recipe. This tres leches cake looks so decadent! What a fun Irish twist adding the Irish cream! Yes! I have recently discovered my love for tres leches cake. 🙂 This one looks and sounds like it would top that list. Irish cream? Yes, please! Omg tres leches is the best! So glad you discovered it! Love the tres leches twist. looks delicious! That looks really fancy! Love the idea of irish cream topping, yum!! Tres Leches is one of my favorites and this looks absolutely amazing!! Thanks for sharing!! Thanks so much! I was shocked at how easy it is to make considering how delicious it is! Hope you get to try it! Well this sounds and looks heavenly! You always make such yummy treats! And I’m pretty sure I have all of them saved on Facebook lol. Happy Monday! Aw you are too sweet! Thanks so much for being a frequent reader! My mouth literally watered while reading this! I am totally going to try to make this though I am not the best at baking! Wish me luck! You got this!! I give you a list of tips at the end of this (and every!) blog post so read them over before trying this out. And I am usually available immediately via email so reach out if you run into issues! These looks so pretty! Sounds like it tastes as good as it looks! This looks divine and I can taste it already. Mixing this Latin favorite with a little Irish twist is superb. What a great idea!!! I knew you’d love this! And you only get a hint of Irish cream so it’s not too much alcohol in the slightest. I’ll make it for you soon! Wow! This looks divine! How long would you say I can keep it in the fridge? Good question! I kept it in the fridge for 2 days unwrapped and it was still good but I think that’s the max because it was starting to dry out. If you’re able to wrap it, it would last another couple days. Thanks for the question!